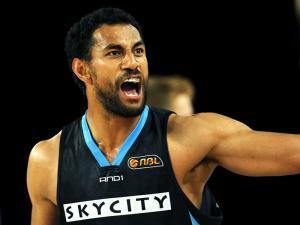 Mika Vukona is the latest Tall Black to ply his trade in Europe. Vukona has headed to Italy to take up a short-term contract with the Virtus Acea Roma club that currently lie tenth in the Seria A with a 12-16 record. Virtus visited fourth placed Dolomiti Energia Trento on Saturday and for long stretches threatened an upset victory. Virtus led by as many as 11 points late in the second period and were still ahead 54-51 at three quarter time. Unfortunately a turnover count of 24 and a disastrous final period, lost 31-14, cost Virtus as they went down 82-68. Vukona had a tough night with the officials picking up four fouls in nine minutes. He snared a couple of rebounds but didn’t attempt any shots as he attempted to settle in with his new team. Virtus next travel to Bologna desperate for a win as they seek a top eight play-off spot. Further east Rob Loe was in the starting line up for KAO Dramas as they recorded a comprehensive 67-51 victory against Nea Kifisia in the Greek League. Dramas dominated the middle stages of the game winning the second and third quarters by a combined 42-25. Loe put together a solid stats line of 5pts/9rebs/3assists/1 block. The win pushes Dramas up to 8th on the table with a 10-14 record. Kirk Penney and his Spanish club Sevilla recorded a notable victory on Saturday edging past top of the table Unicaja 75-70; Just the fifth game lost by the league leaders all season. Penney scored 17 points (5/11 3PG) in 27 minutes to help Sevilla move up to 15th on the Liga Endesa table. Sevilla have won seven of their twelve outings since the shooting guard arrived at the club that was languishing in last place at the time. Despite winning the final quarter La Bruixa d’Or Manresa slipped to an 84-81 defeat at Valencia. This was a creditable performance at fifth placed Valencia but Manresa slip to last place in Liga Endesa having lost four games in a row. Isaac Fotu put together another quality performance with 6 rebounds and 3 assists to add to 10 points (4/8FG). Also in Spain, Tom Abercrombie came off the bench for Gipuzkoa but he had little influence as the San Sebastian club was pounded 91-66 at FIATC Joventut. Abercrombie had a quiet night, playing 14 minutes and scoring just 2 points. Serbian club Mega Leks head to Greece this week for a couple of friendly games before hostilities resume in the Serbian League on May 6th. I hope to bring updates on these games from Corey Webster during the next week.